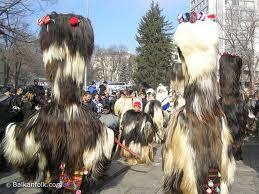 One of the most popular festivals in our country is the festival of Kukeri. It is a traditional Bulgarian ritual to scare away evil spirits with costumed men performing the ritual. The costumes cover most of the body and include decorated wooden masks of animals and large bells attached to the belt. Around New Year and before Lent, the kukeri walk and dance through the villages and towns to scare evil spirits away with the costumes and the sound of the bells, as well as to provide a good harvest, health, and happiness to the village during the year. This festival is usually held in the town of Pernik which is 12 km from our town. This year it was held on 29 January and attracted thousands of people from our country and abroad. A special bazaar called Survakari Village was opened. The Bulgarian and foreign tourists could buy traditional masks, costumes, charms, bells and household items. Survakari wine was sold as well. Many of our schoolmates take part in this festival every year. DOWNLOAD our presentation about Kukeri in Bulgaria. The other importants holiday in Bulgaria is Easter, In our country it is known as Velikden which means ( the faith in the resurrection of Jesus Christ). At midnight on Saturday before Easter Sunday, people in our town gather at St Dimitar’s Church and carry red-painted eggs and bread. When the priest proclaims “Christos Voskrese” (Christ has risen) people reply “Voistina Voskrese”( Indeed He has risen). On Easter we have a unique tradition”good luck crack”. People take turns in tapping their eggs against the eggs of others. The person who ends up with the last unbroken egg is believed to have a year of good luck. DOWNLOAD our presentation about Easter in Bulgaria! DOWNLOAD our presentation about the Christmas Eve in Bulgaria..
What official holidays we celebrate in Bulgaria. Thank you for the lovely presentations. I especially liked the one about Kukeri. I also take part in the festival every year. It’s a great fun! Festivals and holidays are very important to be known. This is what distinguishes us from others on the one hand and unites us on the other. I’m proud of my schoolmates work. Bravo! I’m so happy that my schoolmates spread a word about our town, culture and beautiful Bulgaria.